India’s new pragmatic foreign policy is influencing the bilateral links within the neighborhood. This global impact is evident with the increase in number of questions on international relations in UPSC IAS Prelims and Mains Exam. Here, we are providing an analysis of bilateral ties with our most friendly neighbor Bhutan. Growing importance to foreign policy in UPSC IAS MAINS is evident of India’s rising role in world politics and consistent economic growth. A symbolic shift is seen in UPSC IAS MANS exam where more importance is given to the global polity influencing socio-economic structure in India. Here we will cover India and Bhutan growing relations and future way ahead’s to prosperity. Q1. China holds a crucial factor in India and Bhutan’s bilateral ties. Comment? Q2. How important is Bhutan’s internal security to safeguard India’s energy needs? The basic framework of India - Bhutan bilateral relations is the Treaty of Friendship and Cooperation signed in 1949 between the two countries, which was updated and signed in 2007. Amongst others, the Treaty provides for perpetual peace and friendship, free trade and commerce, and equal justice to each other's citizens. The traditionally unique bilateral relations, characterized by trust and understanding have matured over the years. Today, there is extensive cooperation in the field of economic development, especially in the mutually beneficial sector of hydropower. The meeting took place on the sidelines of the 8th BRICS Summit in Goa. Bimstec comprises Bangladesh, Bhutan, India, Myanmar, Nepal, Sri Lanka and Thailand, and brings 21% of the world population and a combined gross domestic product (GDP) of over $2.5 trillion. Bimstec has more naturally lends itself to regional integration—physical connectivity as well as economic cooperation. As the biggest member of Bimstec, it’s up to India to take all members with it and show tangible results. In terms of connectivity, Bimstec has at last three major projects that, when finished, could transform the movement of goods and vehicles through the countries in the grouping. Bangladesh, Bhutan, India and Nepal (BBIN) have signed a pact for the movement of goods and vehicles among them. BBIN could prove itself as a regional economic sub-grouping, given the willingness of all the countries in the grouping to cooperate. Bhutan has time and again proved to be India’s most friendly neighbor, it has iterated the security situation is deteriorating because of terror and terrorism which cannot be tolerated and the worst form of terrorism is cross-border terrorism. Moreover it stated that SAARC is are all together in fight against terror and what happens in the region is a collective concern. Bhutan and India are friends, and if India’s security undermined, Bhutan will stand shoulder to shoulder with India. And in support of its prominent stand Bhutan supported India’s move to protect its security, its borders and also withdraw from recent SAARC talks that were to be held in Pakistan this year. The 'Project C.A.T - Conserving acres for Tigers' by Discovery Communications and NGO World Wildlife Fund (WWF) aims to conserve the wild tiger population, which has dropped by 96 per cent in the last century due to habitat loss and pervasive poaching. In order to protect and increase wild tiger population, nearly one million acres of protected habitat in India and Bhutan will be covered under the new private conservation efforts. Bhutan has assured that none of its hydel projects are based on storage dams; they are all run-of-the-river schemes. Flooding that happens is weather related because this year has had an unusual amount of rain and they affected India and Bangladesh. Indo-Bhutan Friendship Car Rally 2016 at Tawang, on the border with China.The rally will culminate in Bhutanese capital Thimpu. Bhutan became a protectorate of British India after signing a treaty in 1910 allowing the British to guide its foreign affairs and defence. Bhutan was one of the first to recognize India's independence in 1947 and both nations fostered close relations, their importance augmented by the annexation of Tibet in 1950 by the People's Republic of China and its border disputes with both Bhutan and India. India shares a 605 kilometres (376 mi) border with Bhutan and is its largest trading partner, accounting for 98 percent of its exports and 90 percent of its imports. The renewed India-Bhutan Friendship Treaty not only reflects the contemporary nature of our relationship but also lays the foundation for their future development in the 21st century. The traditionally unique bilateral relations, characterized by trust and understanding have matured over the years. The special relationship has been sustained by the tradition of regular visits and high level dialogues between the two countries. The two sides agreed to continue close coordination and cooperation in areas relating to their national interests and not allow each other’s territory to be used for interests inimical to the other. -->MOUs on bilateral cooperation in the field of education and one MoU on the establishment of Nalanda University were also signed during the visit. -->The BBIN Motor Vehicle Agreement was signed in Thimphu by the Transport Ministers of the four countries in 2015. -->MOUs between India and Bhutan on Technical Cooperation in the Field of Capacity Building, Benchmarking and Bilateral Exchange in Infrastructure Engineering. India’s consistent support to Bhutan and that it will be his endeavor to further strengthen relations between the two countries. Mutually beneficial economic linkages between India and Bhutan have been an important element in our bilateral relations. India continues to be the largest trade and development partner of Bhutan. Planned development efforts in Bhutan began in the early 1960s. The First Five Year Plan (FYP) of Bhutan was launched in 1961. Since then, India has been extending financial assistance to Bhutan’s FYPs. India is Bhutan's largest trading partner. A free trade regime exists between India and Bhutan. The India-Bhutan Trade and Commerce Agreement provides for duty free transit of Bhutanese merchandise for trade with third countries. Major items of exports from Bhutan to India are electricity, ferro-alloys, carbides, bar and rods etc. Major exports from India to Bhutan are high speed diesel, ferrous products, motor spirit including aviation spirit (petrol), rice etc. Cooperation in the hydropower sector between our two countries is a true example of mutually beneficial relationship. Hydropower is one of the main pillars of bilateral cooperation. Three hydro-electric projects (HEPs) totaling 1416 MW are already exporting electricity to India. In 2008 the two governments agreed to further develop a minimum of 10,000 MW hydropower generation capacities by 2020 and identified ten more projects. Power is an important sector of Bhutanese economy. It contributes 14% to the GDP. It is the most important export item contributing about 35% of Bhutan's total exports. There is considerable recent evidence of China’s growing presence in South Asia. While China and Bhutan have disagreed on the disputed tracts in eastern and northwestern Bhutan, the countries are moving closer to a resolution on their disputed border. 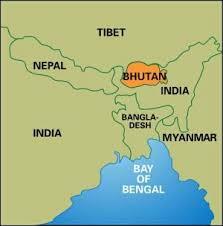 China–Bhutan tensions date back to the Chinese occupation of Tibet in 1951.This resulted in closer ties between India and Bhutan along with an embargo on cross-border trade with China. Chumbi Valley borders Tibet and lies in close proximity to the Siliguri Corridor, one of India’s most strategic and sensitive territories. A crucial element of India and Bhutan’s partnership is India’s effort to prevent China from negotiating a territory exchange deal that would threaten India’s national security. In 2012, China and Bhutan indicated for the first time the possibility of establishing full diplomatic ties following a meeting between the two respective Counterparts of the two countries. This development resulted in the withdrawal of India’s petroleum subsidies to Bhutan to set a definitive message to Bhutan. Although, India’s relations with Bhutan remain firmly rooted, but today’s complicated geopolitical realities teaches us that there are no permanent enemies or friends and China’s growing economic appeal of its One Belt One Road initiative is likely to have a significant implications on the region’s geopolitical landscape. Over the last 60 years, Indian diplomacy has enabled deep political and economic ties with Bhutan. India and Bhutan share close and friendly relations underscored by mutual trust and confidence. This year witnessed sustained progress in bilateral cooperation in all areas of importance hydro-power, transport, communications, infrastructure, health, education and culture, IT industry, and agriculture. India-Bhutan relationship is perhaps the only bilateral engagement in South Asia which has stood the test of time. The relationship has helped Bhutan shape a unique development trajectory based on gross National Happiness (GNH). 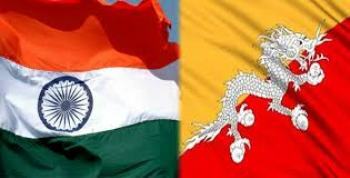 India and Bhutan bilateral relations are characterized by the regular high level political interactions which are instrumental in strengthening the bilateral ties. Recently, the budding importance of international affairs in IAS Prelims and Mains Exam Question Papers can be directly iterated to India’s growing global influence. Here we provide probable questions and India’s bilateral relations with significant countries especially India’s neighboring countries. Ø Massive flood on Indo-Bhutan Border and friendship rally. àMOUs on bilateral cooperation in the field of education and one MoU on the establishment of Nalanda University were also signed during the visit. àThe BBIN Motor Vehicle Agreement was signed in Thimphu by the Transport Ministers of the four countries in 2015.
à MOUs between India and Bhutan on Technical Cooperation in the Field of Capacity Building, Benchmarking and Bilateral Exchange in Infrastructure Engineering.